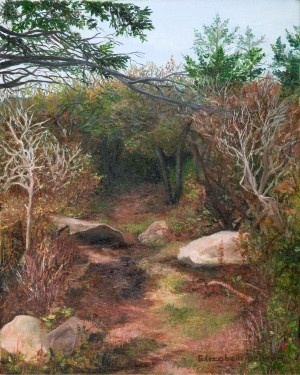 This is one path painting in a series of 20 that I have done from the same area at Easternpoint, in Gloucester, MA. There is a retreat center here called "Gonzaga" where I frequently have gone away to, to enjoy a weekend of silence and solitude and walk the paths of the grounds. There are so many paths here; one could hardly enjoy them all in one weekend. To my delight they change color and shapes with each new season. Provoking new excitement and inspiration with every visit.